Active Components: Feverfew is rich in a variety of components, called sesquiterpene lactones. The most part of them is represented by an element dubbed parthenolide. This component is responsible for impeding excessive platelet accumulation and decreasing the release of particular chemical agents, like several inflammatory mediators and serotonin. Due to this reason the herb can successfully reduce headaches, and enhance tone in blood vessels. 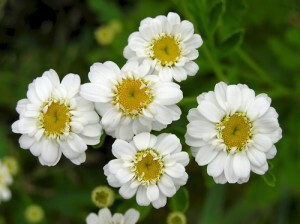 History: In their medicinal scriptures Greek classified feverfew as a medicine for menstrual cramps and inflammations. Conventional homeopathists in Britain applied it for a range of pains, including arthritis, as well as for fevers. Used For: The herb is known to reduce fevers, treat flatulence, relieve constipation, stimulate the digestive system, and induce menstruation. It is successfully applied for headaches. Feverfew may also be used to kill helminthes and reduce gas in the bowels. It eliminates menstrual irregularities in a woman. Additionally, it can be applied to treat alcoholism and hysteria, accompanied by delirium. The blossoms are particularly effective for constipation. Preparation and Intake: The commonly applied herb extracts of Feverfew are standardized to not less than 0.2% of parthenolide. Leaf extracts in pills and capsules are used daily at a quantity of 250 mg of parthenolide. The action is not instant, as the herb needs more than a month to take effect. Safety: If used according to directions, feverfew standardized in parthenolide content produces no considerable side effects. Among the minor adverse conditions are nervousness and digestive upset. Feverfew should be avoided by pregnant or breastfeeding women, and should not be given to infants under two years of age.